Icarus is one of the U.S. Merchant Marine Academy boats and was donated to the Academy approximately three weeks ago and prior to that she hadn’t been sailed in two years. Upon acquiring Icarus, Ralf Steitz, the president of the USMMA Sailing Foundation heard about Skippers Ben Poucher and Tim Fetsch’s active search to campaign a boat for the Atlantic Cup and he generously allowed Icarus to be put into racing condition and used by the young duo. With only five days to put Icarus together and get her to the start line in New York, Ben and Tim didn’t have the same amount of prep time as the other teams and attribute that to being the final team to cross the finish line in the offshore leg arriving Monday morning with an overall elapsed time of 38:42:20. Rounding out the crew of six for Team Icarus will be USMMA Sailing Foundation President Ralf Steitz, AAOT Team Members Emerson Smith, Patrick O’Connor and a still to be named team member. While Steitz’s current role as Foundation President has him campaigning the boats donated to the USMMA Sailing Foundation, he has an impressive resume of inshore racing experience. Steitz was mid-bowman for the AmericaOne America’s Cup campaign in 2003 and sailed with Stars & Stripes for its 1992 and 1995 America’s Cup campaigns. 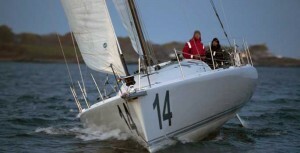 His sailing experience includes match racing and fleet racing aboard Maxi Yachts and 50 footers. Steitz has also sailed in the worldwide grand-prix circuit as trimmer on the Farr 40 Solution and foredeck on the Farr 40 Infinity. The inshore series for the Atlantic Cup takes place Saturday and Sunday May 14-15 in Narragansett Bay. Race organizers are anticipating running approximately four races Saturday and two on Sunday depending on conditions. Inshore races are weighted less in points, however any of the teams could see their current position change dramatically. Currently the standings are: 1st – Dragon, 2nd – Cutlass/11th Hour Racing, 3rd – Toothface, 4th – Icarus. The overall lowest point scorer will win The Atlantic Cup and claim a portion of the $15,000 prize purse.